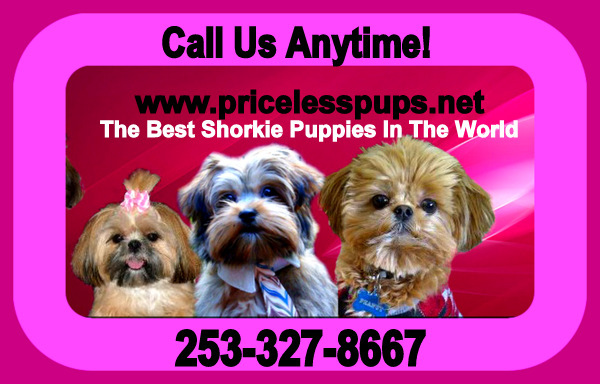 We developed the original Shorkie breed and have established ourselves as the Shorkie Experts. I have taken the time to help you understand what a Shorkie is. I have written all of this information below to try to the best of my ability to describe what a shorkie is. If you see this information on any other website it originated here . Please make sure they have been give our permission to use it. There should be a notation that states they were given it "Courtesy of priceless pups to use. We are currently working with several breeder to help bring more shorkie puppies nation wide that meet the standards of what we think a shorkie should be. Although they are a MIXED BREED does not mean that every shih tzu and yorkie should be bred together to make babies. The parents should be a good example of what each breed standard is separately so the puppies themselves will come from a good gene pool. Please be leery of Shorkies that are advertised at very low cost. Often they are NOT intentional breeding and the breeder has no idea what the breeding will produce. It takes much time and much consideration for a mother and father to be deemed fit for breeding of any breed and especially should be considered when mixing of two breeds takes place. The Mother is always the SHIH TZU and the DAD is always a Yorkie father. The reverse breeding is not "BY US" considered or recognized as a shorkie. This reverse breeding does not produce puppies that look what we think a shorkie should look like. Now a days there are many reasons why people feel they can not have a dog. Some people feel they do not have enough time. Others are concerned they do not have the energy. A few are allergic to dogs and worry about getting sick. No matter what reason or concern you have for not getting a dog, I want you to know that there is a right breed for you and it just may be the SHORKIE. If you are one of the millions of those who work, you may think you do not have enough time to care for a dog. What you must realize is that not all dogs require a lot of time just a lot of quality time when it is spent, playing loving ,cuddling and sharing just as it is with children. For example, Shorkies do not require daily walks, because they can get plenty of exercise just running around the house and are content just being around the house in your lap or at your feet. You may be one who questions whether you have the energy to walk or care for a dog. What you must realize is that not every dog requires a lot of work. For example, a Shorkie is very content in the home. Just sitting brushing him is enough pleasure for him as long as the connection is made. Often in our home a good belly rub is not optional but mandatory for our dogs, but still very layed back and we can sit and enjoy them. Since America is a clean country, perhaps you are one who is allergic to dogs. Surprisingly there are many ways to minimize allergies from dogs. Most people are really only allergic to dog dandruff, so washing a dog often with the right shampoo helps kill dandruff but that too can dry out the skin ..so the Shorkie comes hypoallergenic already. Allergies are not a concern because they do not shed or shed their dander . No matter how little time or energy you have, there is a dog that will fit into your daily life. That is why we have yet to find a Shorkie that could not fit into a family almost perfectly. They seem to be the perfect combination of the two breeds combined. If you carefully research the right dog breeds, you can be sure to find the perfect dog. But we are almost certain that now that you have come across our Shorkies you search has come to an end.!! Well you have made up your mind and found the puppy of your dreams and it is a Shorkie puppy. So much information the internet !!!! That is where the "SCA", TheShorkie Club Of America is here to help no matter where you get your shorkie from. Make a decision to be informed. There is so much misleading information on the website that it only confuses puppy parents to be. So as we tell many people. STOP.. PUT THE BRAKES ON!!! do some research bout shorkies. Well bred shorkies do not through back to the yorkie side on a regular basis.!!!! They are a combination of both the breeds perfectly blended but on a 85%... Range are more shih tzu like in appearance and temperament . On the 15 % occasion that a shorkie looks like a yorkie.. the same rule applies. They should never have thin balding coats!!! that is the first sign of a poor quality breeding or a under lying health issue. That applies to all breed of dogs!!!! It could be a sign of RED MANGE!!! beware. Since starting the Shorkie breed almost 20 yrs ago as of 2009....I have never come across or bred any Shorkie puppies with Thin Balding coats and have never experienced Shorkies throwing back to the YORKIE side on a regular basis as a breeder in Alabama professes. ON OCCASION a puppy may be more yorkie like .. but that rarely occurs and is the very reason we use the shih tzus as the mothers. The Shorkie Club Of America is working on generation after generation trying to get this breed to a "predictable breeding" the same as when you breed a shih tzu to a shih tzu or a yorkie to a yorkie... you get consistency. But the Shorkie Club Of America for the Shorkie does not THROW BACK TO THE Yorkie side. Shorkies that throw back to the yorkie side are never considered candidates for second generation breedings. But are none the less great pets . BEWARE OF ANY WEBSITES MAKING SUCH A CLAIM AND WATCH FOR BALD PATCHES ON PUPPIES HUGE RED Flag!!!! No one has TEACUP Shorkies like we do some websites proclaim!!! Thank God for that!!! Look at the thin balding coats on the websites that make these claims. So you are looking for a Teacup Shorkie puppy? You would be very interested in finding out there is no such thing and the Shorkie Club of America does not recognize Wording like Teacups, Micro, Mini, Teenies and often are just ploys to lure you into purchasing a puppy from a disreputable breeder! The Shorkie also known as a Shorkie Tzu range in size from 4-12 lbs. 4 being very small indeed!!!!. If you are wanting something smaller than this you must also take a look at the health issues that could arise as well as longevity. Why are any breeders trying to down size an already toy sized breed???? Now again please understand we do get the tiny tiny ones on occasion.. BUT WE DO NOT BREED SPECIFICALLY FOR THAT PURPOSEFULLY. It is very common that all breeders, on occasion have that occasionally smaller puppy. However there is NO reputable ethical Shorkie breeder would ever consider breeding on purpose for this smaller size! Nor would they think of breeding any of their females that are in the 2-4 lb. range. Most of your reputable shorkie breeders breed to improve health, temperament, and quality of the puppies they produce and always take the life of the mothers they are breeding into consideration first and foremost. These advertised Shorkies under 4lbs are so much more susceptible to both hereditary and non-hereditary health issues, including birth defects to heart and organ problems. These can occur undetected for a long time, so you would not know until the dog has reached 2 or older. Some can show up early on as well. Many tinies you will see have very very thin coats and balding spots on their bodies. THAT ARE CERF(eye tested by dog (optimologist) OFA( knees hearts ) AND BILE ACID TESTED Yorkie male to ensure the liver is functioning properly! but still problems can arise!!! Shorkie puppies do have a VARIETY OF COAT TEXTURE. Thinner..heavier...very thick... but never thin and balding with no hair on the muzzle or ears or missing on other body parts????? That is a sign of health issues or of terrible breeding practices. So you see you need to NOT make size a top priority in finding a healthy dog of any breed. Finding a healthy, happy puppy with excellent Shorkie characteristics is far more important than size! Do your research on any breeder you choose. Make sure they have years of experience and references in breeding Shorkies. There are a few new SHORKIE BREEDERS that have only been breeding shorkie puppies a very short time that make false claims only to make excuses for the poor quality they are breeding. Take your time when looking for a new puppy no matter what breed you are choosing. Responsible breeders of any breed never try to lure you into buying 2 puppies at the same time. In-fact reputable breeders discourage this. We try and have them wait a few months and then get a second puppy to offer bonding time with the first puppy and the puppy. Ask any professional dog trainer and they will let you know.. getting two puppies especially litter mates is not a good idea unless you are prepared for what it entails. No with that being said we have had families that have wanted two puppies at the same time and were set on that. But they knew what they were getting into and we told them the pros and cons of owning two puppies at the same time. When you see PUPPY SALE on a website it merely is letting you know they are having a hard time placing their puppies. You also will probably note the puppies are much older and have not been adopted so they are no lowering prices to move the puppy by offering a buy one get half price off...It is a very interesting concept having a puppy sale.. But never the less it is important to look into why someone would be having a sale and why they cannot place the puppies they are bringing onto this world. As you will see our shorkie puppies get adopted very quickly because of our years and years of experience in the Shorkie breed and with our puppy parents. That does not mean that you will inevitably find your baby here. But here is a GREAT place to start to gather Shorkie Information. We are firm believers in taking the time to research and finding the right puppy and the right breeder. So please use our web site as a resources to educate yourself. Do not be a VICTIM ONLINE!!!!!! !